After quite some time and fiddling about I can finally say - Welcome to ATB Guitars’ new website! We have changed our name to the more manageable, easier to say and not so daft ATB Guitars. The old name, Atoyboy Guitars, was a relic from days long gone and is now no longer relevant. This is the launch of our new website - www.atbguitars.com Have a look around and please let us know if you find anything broken, wrong, or overlooked in the haste to get this live. I am not saying it will be perfect from day one but with your help and suggestions it will evolve to something everyone can use with ease and enjoy. One of the new features we are happy with is the ‘Make an offer’ button on each product. If you feel you cannot quite stretch to the price of the product as listed then feel free to make a near offer for it and if you have anything you want to part exchange, make a note of it in the comments section. 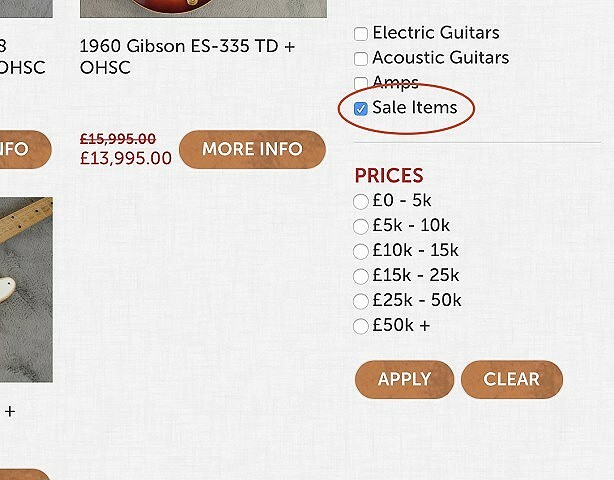 You will also find it easier to sort our vintage guitar stock by manufacturer, type or price. New items will appear on the home page as they are listed. New website, new domain name and soon to be announced new premises will make 2018 a year to remember. To start it off with a kick, we have reduced many of our items across the board. You can see all the sale items by clicking the ‘Sale Items’ check box on the store’s page filters, then click ‘Apply’ (see image). Happy surfing, playing, collecting and purchasing from the whole team at All The Best Guitars!